I went to a cracking event the other day – cracking as in good, but also as in the traditional method of opening a Parmigiano Reggiano cheese wheel. I’d never heard of such a thing before going so was very keen to see what it involved. In Parma by Food Roots – a lovely, intimate Italian restaurant in Charlotte Place, London, was the setting for the evening where a small group of bloggers and journos were in attendance. 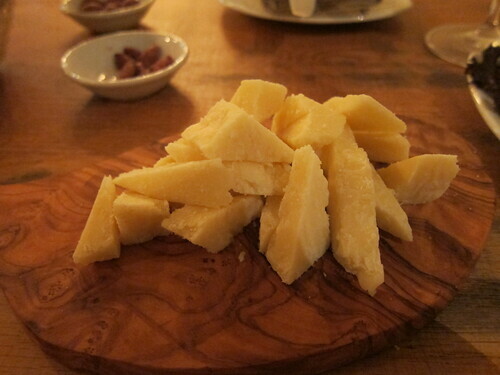 So, what is Parmigiano Reggiano? Well, it’s a Protected Designation of Origin (POD) product, meaning that its place of origin is guaranteed under a system of EU rules that it must confine to. It’s rich in calcium, phosphorous, vitamins and highly digestible. A trained expert demonstrated the opening of the cheese. He used a special set of small stubby knives, known as swords, to robustly and methodically twist and cut around the wheel until about 5 minutes later ‘crack’ – wheel open. I was sort of expecting a mini explosion – it wasn’t quite as dramatic as that, but a fun spectacle to watch all the same. After the ‘cracking’ we were introduced to the different ages and qualities of Parmigiano Reggiano. I sampled the 18,24 and 36 months old cheeses. The 18 month cheese had a light straw colour, sweet, and very cheddar-like. The 24 month was savoury in taste, crystalised, and had a grandular texture. And the 36 month was even harder and richer in flavour. The cheeses were paired with a selection of fruits, a sweet almost syrupy, balsamic vinegar and matching fine wines. Inspired by the demo and tasting I came up with a mushroom risotto recipe using a 36 month old Parmigiano Reggiano, that really brought the dish together. Saute onions in a saucepan with butter and olive oil for 10 minutes. In a separate pan heat the vegetable stock. Drain the oil from the jar of mushrooms then add to the saucepan with the butter and oil in. Add the fresh mushrooms and garlic then cook for 5 mins. After 5 mins add the rice, herbs and enough of the stock to cover the rice (it is important that the stock is hot when added). Continuously stir on a medium heat adding smaller amounts of the stock bit by bit until the rice is tender and creamy. Grate the Parmagiano Reggiano in at the end of cooking, stir through. Check seasoning then serve immediately. Food I Fancy was a guest of the event. 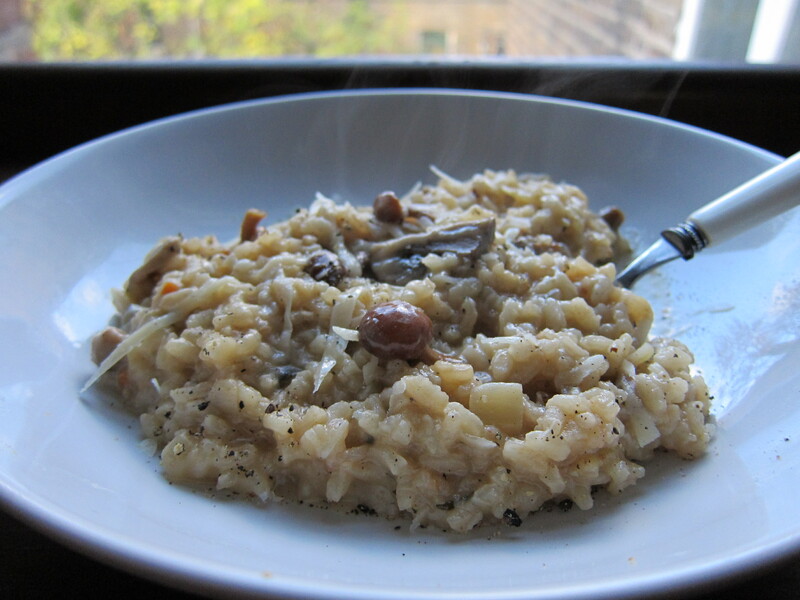 There is nothing quite so yummy as a good risotto with oodles of tangy parmesan (sorry, I meant Parmigiana!). Great recipe and great pictures. I wouldn’t like to try to get one of those big wheels of Parmigiana Reggiano on the bus, that’s for sure!